Hello! 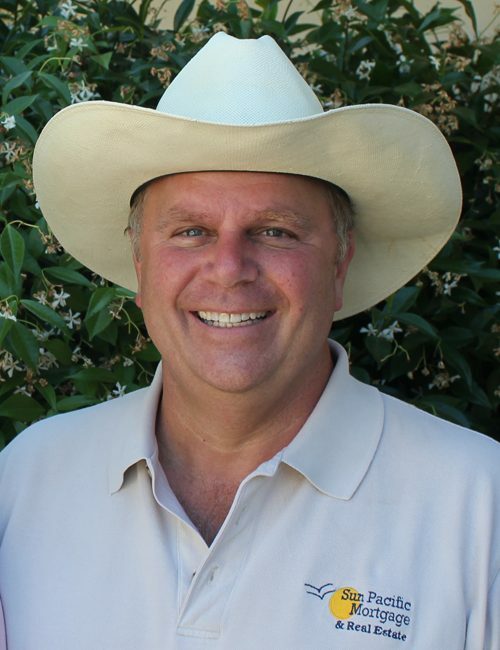 My name is Forest Tardibuono and I am “The Guy In The White Hat – Your Hard Money Lender” of Sun Pacific Mortgage & Real Estate. I am the proud Broker and co-owner of this family owned and operated company since 1988 – when it was established in Sonoma County, California! I take pleasure in working hard to help others via the Hard Money/Private Money loans I offer [to those turned down elsewhere]. Having helped literally thousands of borrowers, buyers, investors, other Agents and Brokers, I continue to strive to deliver the most honest and friendly service to all those I am in contact with. Our company success is that we really like people and helping them succeed. I do so by taking extra care to educate our borrowers, buyers and investors about the current market. The proof of our success are earlier customers returning and referrals from them to friends, family or even simple acquaintances. I look forward to being able to help you or someone you know! I was born in 1957 in Irumagawa , Japan at the Johnson Air Force Base. I have 7 siblings – with 2 sets of twins – so I had my hands full helping out as the eldest! As my father was in the Air Force, we travelled a lot. One can say I was a military brat until 1972 when my Dad retired at Williams Air Force Base outside of Chandler, Arizona. We had moved back and forth, living in Illinois, Japan and finally settled down in Arizona. My Mother was a teacher at the Catholic Grade school I attended and she was my teacher through my 7th and 8th grades for English, art and music. I graduated Chandler High School in 1975 where I succeeded in achieving a letter in football, wrestling and believe it or not, in Debate! I also must mention my 7 proud years of newspaper delivery of “The Phoenix Gazette” and the Sunday morning paper “The Arizona Republic” where I worked hard and was rewarded with paper boy of the month and year. After College I went to Arizona State University on a debate scholarship. Graduated with a Bachelor of Science Degree in Business and Public Administration in 1982 and also joined the national social fraternity Phi Sigma Kappa. I moved to La Jolla, California and did first year’s law studies at Western State University College of Law where I met my lovely future spouse and co-owner, Lynn. We married in 1987 and chose to move to Santa Rosa, CA. in December of 1987 because of how beautiful it was here. Our daughter, Megan, was born January 30, 1989 and happily joined our family of Lynn’s two sons from her previous marriage: Ken,7 and Phillip, 3. We opened Sun Harbor Mortgage on January 11, 1988 which was a branch of a San Diego Mortgage company. Since we had a true personal desire to help others in this county with honest financial services, we bought them out in June 1990 and changed the name to Sun Pacific Mortgage which has since evolved in 2004 to Sun Pacific Mortgage & Real Estate as we offer both real estate and mortgage/lending services. Throughout my tenure as the Broker, I worked diligently to deliver the best service to all our customers and received the prestigious Model-Of-Admin-Know-How Award from WISE International for 10 consecutive years, beginning in 1997. On weekends I enjoy fishing, gardening and golf – as well as a variety of other activities including spending joyful time with my two grandkids, Braden who was born July 2009 and Kallye who was born February 19 2012! Feel free to call me up at 707/523-2099 to ask any questions about real estate financing, hard money loans, real estate investing, advice on some other financing option or even just to refer a friend or family member in need of my services or to get help yourself. Our newly designed website is regularly updated with timely information, tips, articles and videos about the current market of real estate and lending so take a moment to check it out: https://www.sunpacificmortgage.com//. You can also sign up there to receive regular emails with local related real estate tips, timely loan regulations, upcoming houses for sale not yet on the market, market updates, business advice, etc..